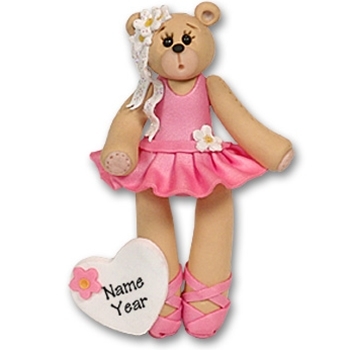 This little Ballerina Bear personalized Christmas Ornament has on her tutu and is ready for the stage! A wonderful way to commemorate a special time in your child's or someone else's life. The ornament comes complete with a hook and pink satin ribbon for hanging. Designed by me and handmade from Polymer clay, this ornament is just one of the more than 500 different ornaments in my line. Can be personalized absolutely FREE!